I edited this article from a fellow NSA doc. She has done an excellent job explaining the 5 spinal cord tension patterns. How your mind shapes your spine!! by Dr. Stephanie Bridwell M.S,D.C. It is a well established fact that physical, emotional, chemical and mental stress affect our ability to play full-out in the game of life. Our inability to rebound and flex with these stressors equates to un-resourced tension harboured in the body's tissues. We end up feeling stiff as a board with our spines frayed like a cat that has been dipped into a tub of water. Bound tension strangles our life-force which is the vital energy we need for living and thriving. Most people live with the assumption that tension is bad and should be gotten rid of. However, research has shown that tension is a natural, and potentially useful, part of everyday life. The problem is not with the tension, but with our bodies defending against it. Pain and problematic health patterns occur when instead of using life's tension to rise to the occasion and therefore surf the waves of life, we resist and contract against what is supposed to be life giving energy. In the work of Dr. Donald Epstein, there are five main distortion patterns that the spinal cord contracts into when tension exceed what one can handle in the moment. 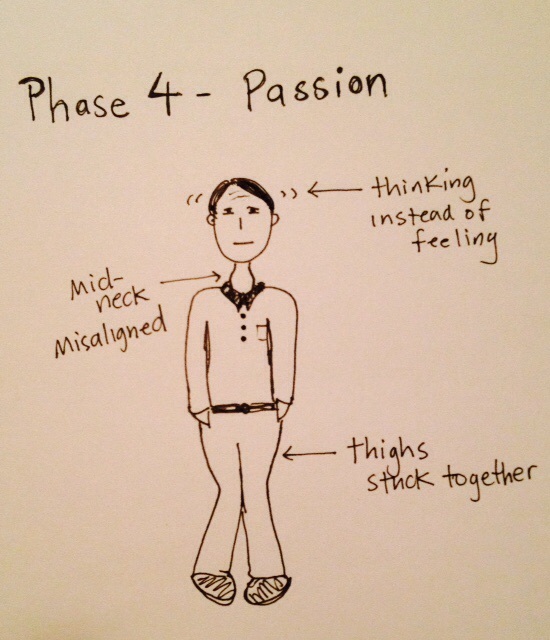 They are called the Five Phases, and each has a distinct personality that over time is habitually reinforced. Below is an explanation of the five phases as seen as a "continuum of consciousness". When there isn't enough available energy on the continuum, the energy is expressed as an obsession or pain. In contrast when there is plenty of energy, there is healing. 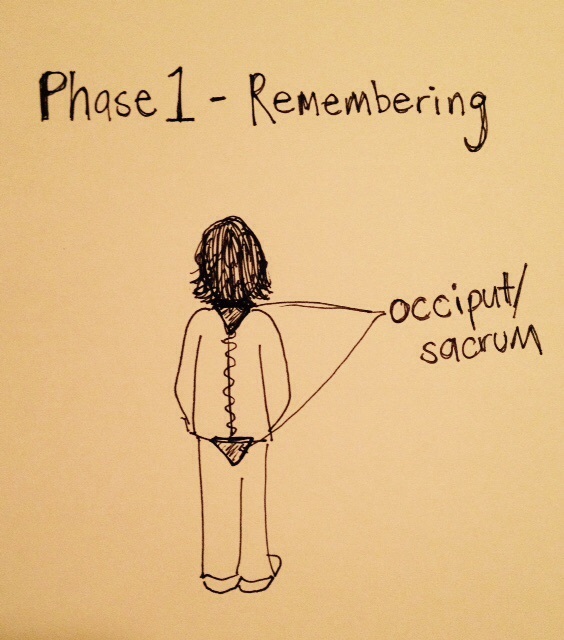 PHASE 1- Is about REMEMBERING. 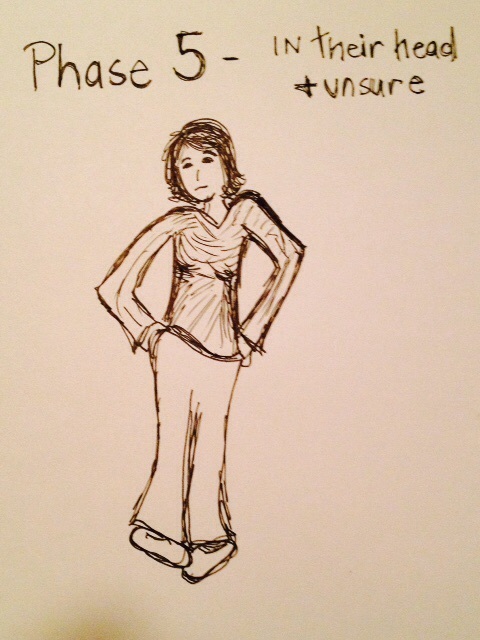 This phase goes into distortion when a person gets stuck on the idea that the past is responsible for their problems. In this phase, they will say things like, "if only blank didn't happen, everything would be ok." They may obsess about how their mother was too busy taking care of siblings to have time for them. Or they may wish that they had more help with homework or dinner together as a family, because they are convinced they would be happy today if this had happened. When this distortion is freed, a person may have a realization that their mom's busyness freed them up to develop creative play on their own or that dinner didn't happen because their parents loved them so much that they worked split shifts in order to put food on the table and not have to get babysitters. 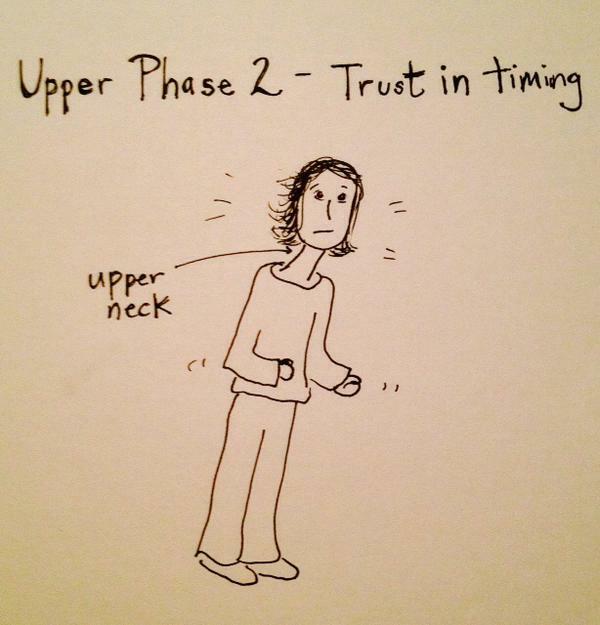 PHASE 2 is about TRUST. Have you ever seen people that walk with their head two feet in front of their body? This repetitively distorted the upper bones of the neck and these people obsess over time... not having enough time, not going to get there in time, there is never enough time... etc. You know them, you've seen them rushing around like chickens with their heads cut off. Their deepest fear is that they aren't going to be enough. Because they will never be able to get things done in time. Have you ever felt like you just want to be invisible? Ever do all you can to just get through the day or the party or event without anyone seeing you? How about all the things we do to feel loved? Have you ever changed who you were to fit in? Ever violated your own rules to avoid someone else's disappointment? Feel into your body when remembering this... what happened to your hips and pelvis? It's hard to stand strong and balanced in our hips when we are betraying our sense of self. We will typically twist or rotate and misalign in some way to match how we are twisting around our own truth. When energized we realize that our identity is the gift we are here to give to the world. When we aren't giving, it is supposed to hurt - this reminds us to get back on track. The gift here is really being able to be seen for who you are and this translates into taking charge of your life and developing true leadership. Through surrendering this pattern the tension in the pelvis is freed and we have the energy to LEAD our SHIP. the mundane has narrowed. When this happens our mid-neck locks up and our inner thighs tense. It's like we are literally holding back a dam from breaking. What we are holding back is our full expression. We trade thinking for feeling. When this is energized we are more present for the beauty in each moment, and remember that we have hopes and dreams and that they can actually come true. We begin to savor the way we eat a peach, to drink slowly from our water bottle feeling the hydration move into every cell in the body. When we are passionate, it's hard to think about things... this is why being in your head drains passion. There is a time and place to think, like goal planning, problem solving, remembering addresses or phone numbers. Passion is born in a space free of words and thoughts. Passion has a much greater energetic value to your metabolic system and is necessary for a fulfilling life. Most thinking is simply the ego's way of justifying its existence. Name it, value and appreciate it and you will be well on your way to liberation of bound thought energy and swirled into the ecstatic dance of your life. 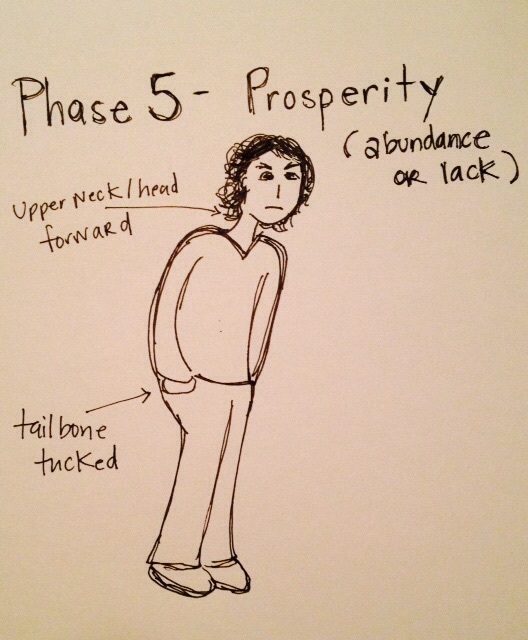 Phase 4 involves fixation and misalignment in the middle neck. There are two variants of this pattern. The first is a rounding forward of the lower neck and tailbone. This spinal cord tension pattern evolves when we feel violated in some way. This happens in those moments when we are sure something is being withheld from us. Perhaps it was a parent's love, fame and fortune, the dream job, the perfect relationship, or the desire to start a family. Somehow we internalize it as if we're the only one. 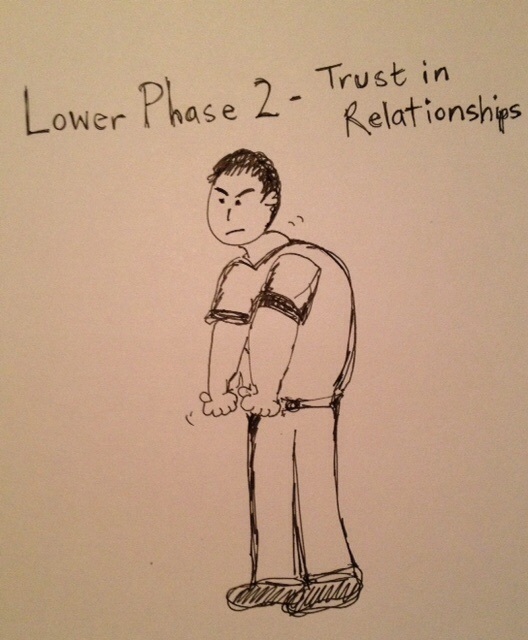 The other pattern involves the mid neck and hip swaying laterally out from under us in the position of the 'thinker'. There is a holding back of energy as one is waiting to 'get it'. Their story is that they can't really be seen or be more involved until they understand themselves, the world, or something better. Thoughts are a way of hiding out. When energized we begin to realize that maybe nothing was ever withheld from us, but that life is actually sensitizing us to challenges and situations to know what it feels like because it is the gift we are here to learn and to share with other people. When the top and bottom of the spine contract it is associated with downsizing and preserving energy and when they are freed we experience the abundance that is our true nature and birth right. 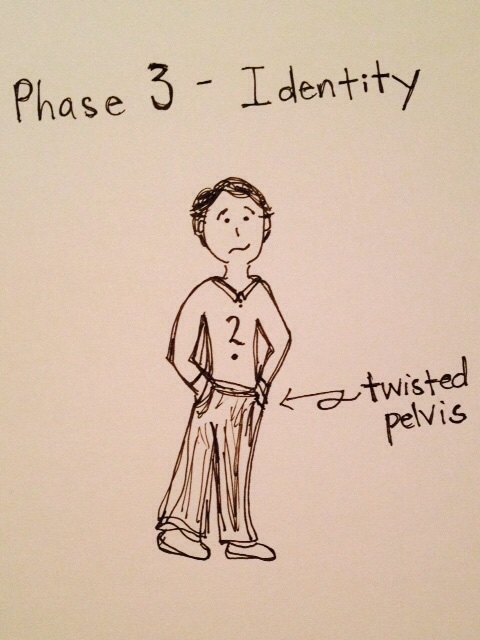 Phase 5 involves the neck and pelvis distorted simultaneously. To try at home: Put your spine in these positions to get familiar with the outward expression of your inner world. You can learn to tune into the information and connect with each of these distortions and their consciousness states at any time and begin to see your patterns then consciously change your position.